I used to have a coworker from Canada who used to explain some of the Canadian mysteries of life - proving that natives actually say eh, why curling is a sport, poutine, and for me, the Royal Canadian Mounted Police. Mainly, because we got to talking about the RCMP, the show Due South (that I never watched, but my sisters did), and Dudley Do Right (whom I love, but not really as much as I love Brendan Fraser). The way my dearly missed Canadian colleague explained it, is basically, they're the equivalent to our FBI, being essentially a national police force. 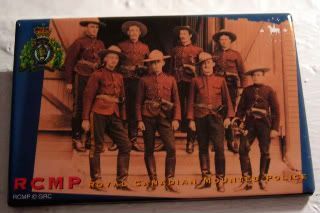 More about the RCMP in a later magnet, since apparently, I have a few of them. I know you're shocked. Have ya'll watched this (Canadian) show called Flashpoint? Because you should. Even if it's on Friday nights and you have to DVR it. Honestly, with almost 60 shows on my dance card throughout the year, you'd have thunk the show about a Toronto Strategic Response Unit (SRU) team (not to be confused with the RCMP, thank you), with cute-cute-hot Canadian boys and big guns would have gone off my radar. Or, not, if you know me at all. It's one of my top 20 shows. Seriously. For some reason, the storylines always get to me. They generally start out the show at the point where things have escalated (usually a hostage situation) to where their team already has "a solution" to take out the perp, and they flash it back to how they all got into this situation (from the SRU team's POV, but also the bad guys, who aren't always as bad as you think). For the most part, I think use of flashback in a story can be lazy and somewhat boring, but they manage to get you back to the flashpoint fairly quickly, and we watch (sometimes with bated breath) how the team resolves the situation, through conflict resolution/negotiation tactics, trying to talk the perps down, or through brute force, if they have to. Awesome. And the cute-cute-hot boys and the big guns don't hurt, either. Seriously!! I was addicted to Due South!! I can relate to your comment about the cute-cute-hot Canadian boys -- yes, it's true and it's generational!!! Shall we say, been there, done that and leave it at that? LOL Thanks a bunch for your always cool posts! !